Everyone loves a good mad scientist. Especially an eternally optimistic and enthusiastic one. Wheeljack, for a startlingly brief period of time, was the Autobots’ inventor, their tinkerer, their chuckling resident time-bomb. It generally wasn’t a question of IF Wheeljack’s latest contraption would blow up in their faces, but WHEN. The Autobots seemed to tolerate this largely because Wheeljack was so easy-going. When whatever he’d been working on melted through the floor or went berserk or was stolen by the Decepticons or caused a nationwide blackout, Wheeljack would cheerfully repair the damage he’d caused and go right back to the drawing board. He would, of course, occasionally get things right. Oh no, what the hell is that? 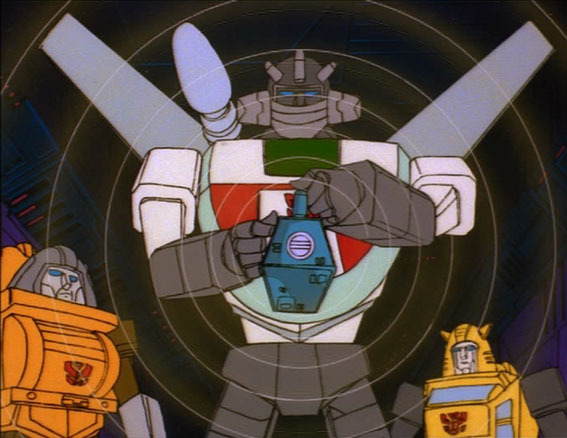 Wheeljack has the distinction of being the very first Transformer we ever see on television. He also has the distinction of the only Transformer whose “ears” blink when he talked. As a child, this unique feature captivated me. And really, it makes a great deal more sense than robots with lips. There’d never be any confusion as to who was speaking, and you’d have a guaranteed light source if needed. That, and among a group of Transformers with heads that differentiated only with simple crests or horns or antennae, Wheeljack stood way out. It is, unfortunately, something that future incarnations of the character got away from entirely. Oh NO, what the hell is THAT?! 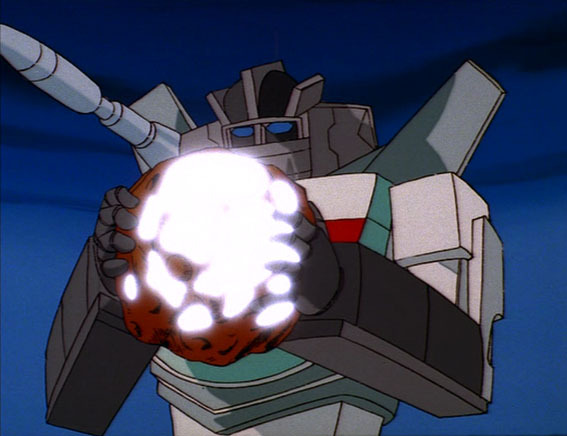 Wheeljack’s greatest (or worst, depending on your perspective) contribution to the Autobot cause was the Dinobots. After finding some fossils in the caves around the Ark, the mad scientist was inspired and built three new robots based on the Tyrannosaurus Rex, Triceratops, and “Brontosaurus.” He gave them their size, strength, and – unfortunately – their walnut-sized brains. Grimlock, Slag, and Sludge were little more than the savage beasts they were modeled after and nearly destroyed the Ark before Wheeljack got them back under control. Optimus ordered their destruction, but Wheeljack secretly upgraded their intelligence. Which was fortunate, because the Autobots were later incapacitated and the Dinobots charged to the rescue. And while it was never explicitly stated in the show, it seemed that while the Dinobots only reluctantly followed Optimus Prime’s orders and had rather frequent bouts of insubordination, they were far more receptive to Wheeljack’s authority. Wheeljack tinkered with the Dinobots on numerous occasions and even built two more – Swoop and Snarl. But as the second season wore on, Wheeljack was getting pushed to the periphery by johnny-come-lately Perceptor, whose effete speaking voice and microscope alternate mode made him seem far more “scientific” than the shoot-from-the-hip cowboy science that Wheeljack employed. Then, in the 1986 movie, Wheeljack was unceremoniously killed off during the Battle for Autobot City. Then began the Dark Ages. Unlike other Transformers whose popularity kept them alive and largely unchanged throughout numerous incarnations, Wheeljack pretty much vanished from the face of the franchise until 2003, when Armada brought the name – and just the name – back as an Autobot-turned-Decepticon that shared no character or physical traits with the G1 character aside from being a robot that turned into a car. Oddly enough, the same continuity introduced a character named Downshift that had Wheeljack’s colors and Wheeljack’s trademark head, but also bore no resemblance character-wise with the original. 2008 and Transformers: Animated brought Wheeljack back to his roots as a reckless scientist paired up with the emotionless Perceptor, but he was barely in the show that ended soon after his first appearance. Many fans believe he and Perceptor’s designs for the series closely resembled the human stars of the Mythbusters show, but the art director swore that this was entirely coincidental. 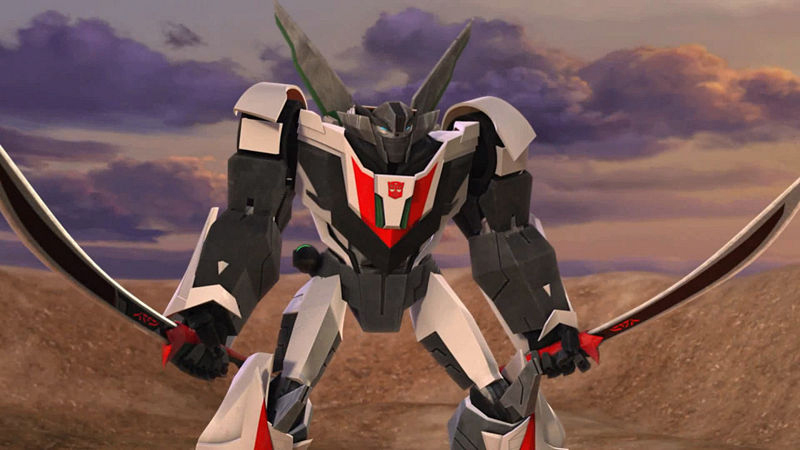 Currently, Wheeljack slices through Decepticons on Transformers: Prime as an elite warrior once teamed up with his buddy Bulkhead on the infamous Autobot squad that calls themselves the Wreckers. 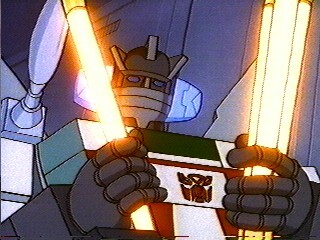 Again, while Wheeljack looks his old self (aside from the lack of blinking ears), the dual-sword-wielding fighter bears little resemblance to the good-natured inventor. Instead, the role of slightly-crazed scientist is filled by the curmudgeony Ratchet, and Wheeljack merely guest-appears from time to time. Wheeljack has invented a device that slices things! He calls it a “sword”! Why Wheeljack, an original member of the Ark Crew and one of the more interesting characters in Transformers history has been so frequently altered or forgotten is beyond me. He practically embodies the very idea of Transformers, a crazy notion that occasionally backfires but is too cool and unique to turn away from. Tags: Autobots, Dinobots, G1, invention, mad scientist, Prime, Transformers, Wheeljack. Bookmark the permalink. Michael Bay’s movies don’t so much change character as they are practically devoid of it, but I’ll get into that tomorrow.